Lock in a great price for Crowne Plaza Dead Sea Hotel – rated 8 by recent guests! Excellent hotel with a great location -close to the shops, restaurants and the beach. We purchased the dining options and the quality (and quantity) of the food was exceptional! The room was comfortable, clean and high quality sheets, shower was great and the air conditioner was excellent. The room was very comfortable with a nice sea view from the balcony. Breakfast was good, various options, excellent oranges and tangerines. Deck chairs and furnished beach. Nice King bed with excellent view of Dead Sea, robes, nice toiletries, at check in the young man who assisted was smiling and kind, found parking in the hotel parking even though it was very full. Loved that it was directly on the beach with ez beach access great views from room pool indoor and outdoor and food was pretty good too! Hotel has its own beach, beautiful view from the room, comfortable bed. Great location and beach, view. Breakfast was excellent. Best place in town (a very small town). 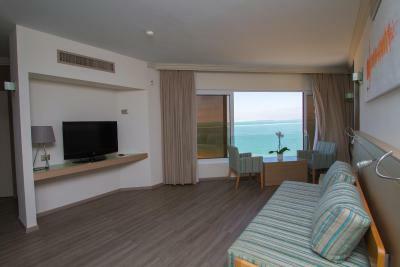 All the rooms have a great view to the Dead Sea. Nice beach, well set. The pool is amazing. Touristic restaurant at the hotel, with a rather bland food. But there are not several choices around so we had dinner there. Set right on the beach, Crowne Plaza Dead Sea Hotel features a large freshwater pool. 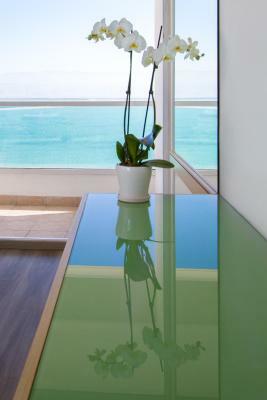 The rooms are elegant and offer views of the sea. There is free WiFi throughout. The large and luxurious spa offers a fitness room, a heated pool with salt water from the Dead Sea, 2 hot tubs, wet and dry saunas, and 2 pressure showers. A wide variety of treatments and massages are available. All rooms at this Crowne Plaza come with parquet or carpeted floors, air conditioning, and a tea/coffee maker. Some have a private balcony. The hotel’s entertainment staff offers a varied program of activities including shows, performances, games, workshops and more. When would you like to stay at Crowne Plaza Dead Sea Hotel? This room faces East and offers views of the Dead Sea. It includes free Wi-Fi and has either carpeted or parquet floors. All rooms are air conditioned and include cable TV, a minibar and teakettle. The deluxe is a spacious room with parquet floors and elegant furniture. On the top floors of the hotel, it offers panoramic views. Including free Wi-Fi, all rooms are air conditioned and include cable TV, a minibar and teakettle. Smoking is permitted in this spacious suite. Featuring free Wi-Fi, all rooms are air-conditioned and include cable TV, a minibar and teakettle. Offering views of the Dead Sea and access to the business lounge, his room includes fre WiF, parquet floors, and an electric kettle with a selection of tea and coffee. Children are not allowed for executive rooms. Only adults. Featuring parquet floors and elegant furniture, this spacious suite features 1 bedroom and a living room. It includes free Wi-Fi. All rooms are air conditioned and include cable TV, a minibar and teakettle. House Rules Crowne Plaza Dead Sea Hotel takes special requests – add in the next step! Crowne Plaza Dead Sea Hotel accepts these cards and reserves the right to temporarily hold an amount prior to arrival. The rates given are for tourists holding a foreign passport. For guests holding an Israeli passport, additional VAT will be applied by law. Please note that check-in on Saturdays and Jewish holidays may be postponed until 19:00. Everything was fantastic. The rooms were large and clean. The view is out of this world. Friendly staff. Comfortable beds. Private beach right downstairs. All the spa facilities with any treatments you can wish for. As an international tourist there was no help with transfers, sites to see, or any other advice. There was one eating place which had a food package. The eating room was huge and without character. There was no place to get an a la carte meal. A wine list was non existent. Easy access to there Dead Sea. The bedrooms are good with sea views. It is a good place for families and the elderly on a budget. I liked the location, the friendliness of the staff, the facilities and the beach. They served a rich breakfast buffet. The walls are paper thin. There are not enough sun umbrellas on the beach. The lounge was excellent. Food and staff were great. Careless staff, crowded parking, dirty common spaces, dirty room windows, loud music in the pool, almost no amenities. We liked the very comfortable bed and breakfasts. The breakfast area was a bit crowded, but they were doing some remodeling near that area and it was looking very nice - maybe they are improving. We had a beautiful view from our balcony. The room was very pretty and comfortable. They had free water/lemonade in the reception area. All you can wish for a good and relaxing stay. All rooms have sea view. We arrived shortly before the season started (mid-March) and were granted a free balcony - perfect for enjoying the view and the air even if it's still rainy. We loved evening walks alongside the beach and were positively surprised by food quality and portions in the restaraunt. Beach, pools, bathrobes and towels included. Cosmetics and souvenir shops on-site. Good fridge. One can enjoy full service during the day after check-out. Join the awards program! Expensive spa offers that were nothing special. Overcrowded when the season starts - try to be there a bit earlier than others! Don't hesitate and grab that Genius offer. I don't see a big difference between this hotel and a luxurious one - the services are almost the same, the price is much better. Spacious well-furnished rooms. Clean own beach, towels and bathrobes for free. Cold and hot pools included. Don't spend money on a standard buffet - the restaraunt offers delicious food in large portions for lower prices. Kedem cosmetics store (very effective for my allergic skin!). 10 mins walk to the shopping malls. 15 mins to a cheap Arabic restaraunt with lots of meat. There were works, the restaurant was tired, the carpet was old and dirty, it was basically a canteen. Clearly a has been hotel. It was probably fabulous 20 years ago. It now needs a total refurbishment. The air con was not working properly. Irritating to have a card for the pool towels. And closing access to the beach and the pool at 4pm is ridiculous. Nice location, nice private beach, good size pool, nice views. Good bed, slippers and bathrobes. Towels tired from usage.